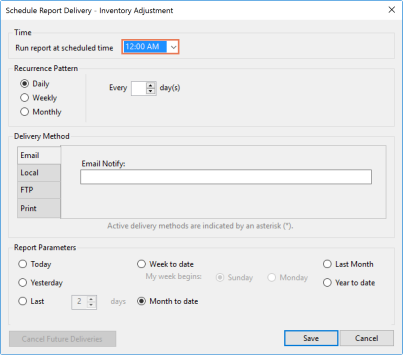 For some of the reports in the Reports area of Ascend, you can schedule the report to be run and delivered to you (or anyone else) automatically. Not all reports can be scheduled this way, but we are working on adding more to that list all the time! 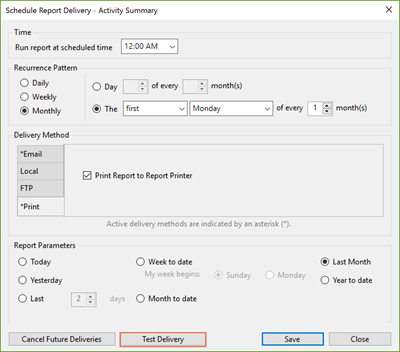 If a report is able to be scheduled, it will have an active Delivery icon near the top of the window. 1. Select the Reports icon on the Ascend desktop. 2. Highlight the report you'd like to schedule. 3. Check that the Delivery icon is active. 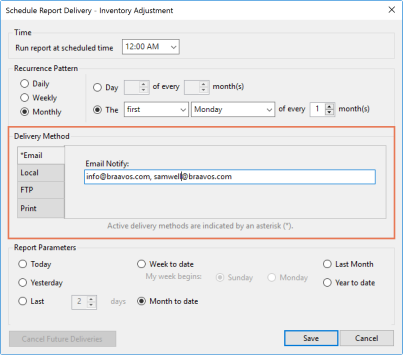 If it's active, you can schedule this report. 4. Click the Delivery icon. 5. Fill out the Time section. a. 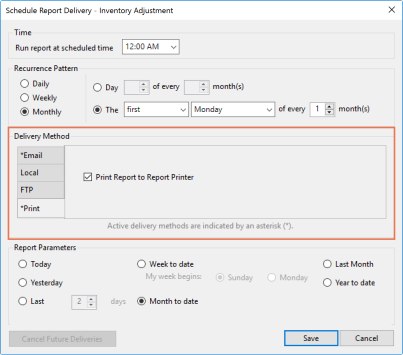 Choose the time you want the report to run from the dropdown menu. 6. Fill out the Recurrence Pattern section. a. Decide if you want the report to run Daily, Weekly, or Monthly. b. Fill out the information to the right (for example, if you select Monthly, you could fill out the first Monday of every 1 month(s)). 7. Fill out the Delivery Method section. 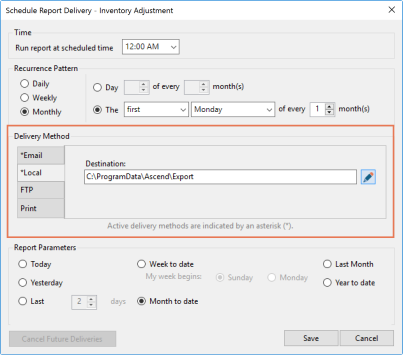 You can set up multiple delivery methods. a. If you'd like, enter any Email addresses you want to send the report to. You can send it to multiple email addresses by dividing them with a comma (,) or semicolon (;). b. If you'd like, select a Local folder on the server where you'd like to save the report. 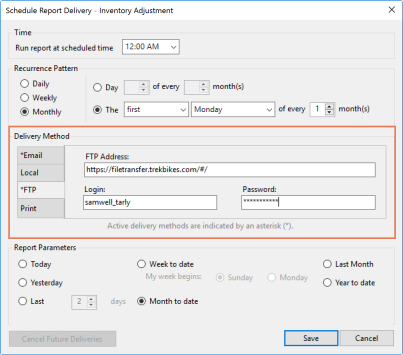 Sherpa Tip: This option can only be selected on your server (database) computer. c. If you'd like, fill in the information for an FTP site you'd like to save the report to. d. If you'd like, go to Print and check the box for Print Report to Report Printer. 8. Fill out the Report Parameters section, if needed. a. This typically includes setting a date range to run the report for. Your report is now scheduled for delivery. 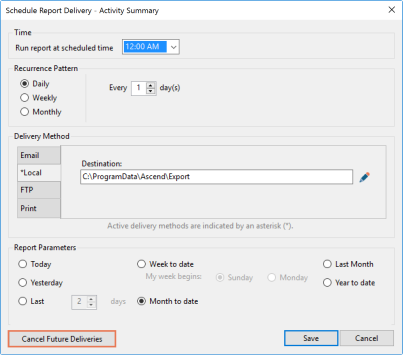 Select the Test Delivery icon on the Schedule Report Delivery window to verify your delivery is working. 2. Find and highlight the report. 3. Click the Delivery icon. 4. 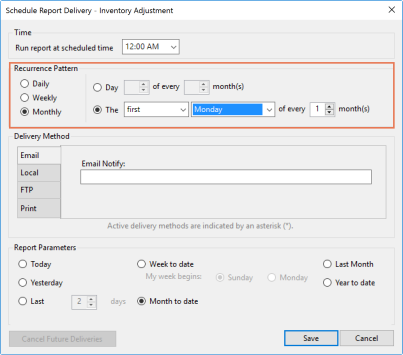 Click the Cancel Future Deliveries icon. Your report will no longer be delivered automatically.